These YouTube videos are "A look at the Canada Land Inventory Geo-Information System, a computer system used to help manage and develop Canadian land". The issues feature in the first video with Tomlison himself appearing at the end, the processes in the second video and the GIS system itself in the third. 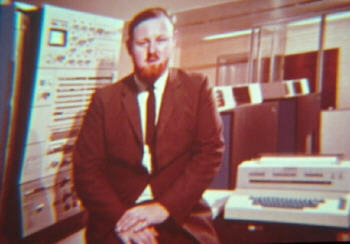 looked like over forty years ago - video terminals, teletype, punchcards, female clerks and male techs & managers etc. intended to educate the public of all that is invloved in this, and in plain if long-winded language, complete with Telstar-like space sound effects! Footnote: that system was almost lost but survived in the Canadian Soil Information System. Nice blog !! i also know a very good site for esri gis apps.cybertech(. )com !!! Yes I love your website too! I used to know Cybertech people when @ ESRI, I cannot link back to 'cool', would you mind (re)posting a contact?